We had one of those special Road Scholar moments just before our lecture concert on Sunday. A lady approached us and told us that she had signed up for this tour on recommendation. And seemingly one of the main reasons for the recommendation was us, Julia and Walter! We definitely feel very flattered – thank you so much, Doug and Lilly! And speaking of recommendations: in August 2015 there will be a series of Salzburg/Lucerne Festival tours. We will be with the groups during the Salzburg part of the tour thrice, and the program in general sounds fantastic. We’d actually love to take it ourselves if we weren’t working there. But we can definitely recommend the tour- it would be lovely to reencounter some of you there. Since there’s a couple of lectures coming up, I’m brushing up on my Mozart. And I came across a little detail surrounding the Requiem I wasn’t aware of before and that just begs to be shared. Even so, the Count either didn’t spot it, or he didn’t care. Constanze sold the Requiem five times: to the Count, to King Friedrich Wilhelm II. of Prussia, one for an “official” first performance, and two to publishers. Quite the businesswoman, and not the flighty airhead some earlier biographies would have us believe! This is a little outside our usual line of work as Auers’ Flutery, but some of you might like to know: Walter is heading a masterclass and summercamp for almost all levels and ages from July 5-12. We have a great team of dedicated teachers and flutists that offers classes to kids and teens from age 8 on, to students and also to adult amateurs flutists! This is of course no Road Scholar tour, but Walter has been asked for lessons by tour participants in the past, so this is your chance!!! – if not to have a lesson with him personally, but to listen in on his teaching and to spend a week immersed in flute playing and flute related topics, and all that in a spectacular former monastery on of the most beautiful Carinthian lakes. Participation is on a first come, first served basis, with no auditions necessary at the course itself. You might not want to hesitate too long though if you are thinking of joining us. 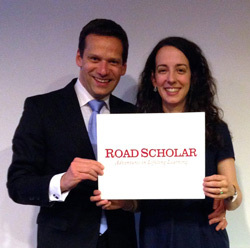 As you know, we work almost exclusively for Road Scholar. This company seems to unfailingly attract the kindest, nicest, most interested and interesting people – we love meeting you and are always almost sad to see you go. This is especially true of the music groups that we see thrice during their time in Vienna. We’re really looking forward to the Salzburg Festival groups that will start in 2015 because it will give us another opportunity to get to know „our“ groups more closely. „I want to tell you how much I enjoyed the VPO at Weill Hall in Cotati, California, on Tuesday March 11. I was so happy to see you and to hear you, after having met you and your lovely wife in October, 2012, when you hosted our Road Scholar group to a private recital. That evening, the rehearsal in the Musikverein [of Das Paradis und die Peri], and the chat our group had with you in the Vienna State Opera House, are among the most precious memories I have of that trip. Also to tell you: The woman sitting next to me Tuesday evening—a stranger to me—also recognized you, because she took the Road Scholar tour in the autumn of 2013. You have fans here in northern California! What an incredible coincidence! Thank you for sharing! And if the incredibly enthusiastic feedback is anything to go by, it was pretty good! We weren’t quite sure if our usual mode of concert communication was going to work out in a) German and b) outside of the study-tour context, but it went beautifully. So many smiling faces in the audience, thanks to everybody who came and contributed to the great, positive atmosphere of the evening! Audience members often don’t realize and appreciate enough how important they are to an event, especially in a format that communicates on multiple levels. Music is a team effort, and it takes the composer, the musicians and the listener – and boy, where you good at listening the other night! Thank you again! And a tremendous shout out is due to our fellow Flutees: Joanna Lewis, Anne Harvey-Nagl, Johannes Flieder, Martin Rummel, Jurek Dybal and Monica „Momo“ Melcova: you were beyond amazing. Working with you was a pleasure we hope to repeat! Ming Wang’s newly commissioned piece somehow deservedly became the focal point of the whole evening, which would have been impossible without our brilliant, ever calm and supportive conductor Gottfried Rabl.